In November 1918 a photographic unit of the U.S. Signal Corps arrived in Siberia to cover Operation "Polar Bear", the American intervention in Russia. At the end of World War I the United States had sent two forces to Russia. The 339th Infantry Regiment was sent to Archangel and Murmansk near the Arctic Circle, initially to protect supplies and help reopen a second front against Germany. The 27th and 31st Infantry were sent to the Vladivostok region, to assist Czechoslovak military units trying to make their way to the western front. The experience in Siberia for the American soldiers was miserable. Problems with fuel, ammunition, supplies and food were widespread. Horses accustomed to temperate climates were unable to function in sub-zero Russia. Water-cooled machine guns froze and became useless. During their time in North Russia from 1918 until 1920 the American forces suffered more than 210 casualties. In fact, America's first war with Russia turned out to be a dismal failure. At least 5,000 U.S. troops were sent into Russia to kill Bolsheviks, but after the Armistice most of the soldiers just wanted to go home. Early in 1919, instances of rumored and actual mutinies became frequent. As a result, President Wilson directed his War Department to begin planning a withdrawal from North Russia. 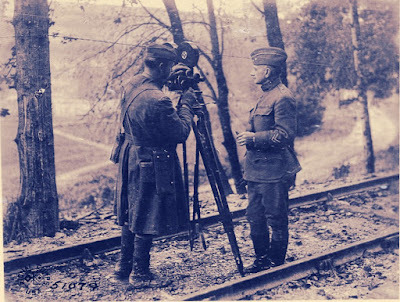 U.S. Signal Corps cameramen recorded America's first war with Russia and produced 1,200 still photographs as well as 12,000 feet of motion picture film. The films were filed at the National Archives in College Park, MD, and until recently only a few scenes of this strange war were made available to the public. This all changed when in December 2014 the National Archives uploaded 14 reels of footage on the Internet, showing the activities of the American Expeditionary Force in Siberia. Here are these films as uploaded by the National Archives on YouTube. 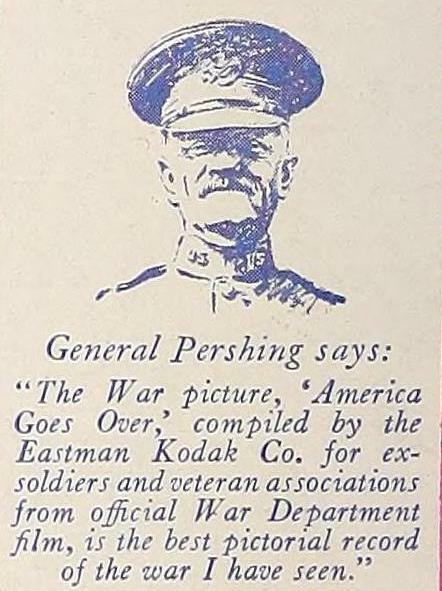 On October 8, 1927, the Eastman Kodak Company presented what was announced as "the only picture record of America's part in the World War officially released for home projection." For the first time in film history, the audience could watch actual scenes from the battlefields of France in their own living room. These first home movies of the Great War were available for $150. The footage was on 16 mm, a revolutionary new format Eastman Kodak had introduced in 1923 as a less expensive amateur alternative to 35 mm film. Sixteen mm film was one of the first formats to use acetate safety film as a film base. Kodak never used nitrate film for this format because of its high flammability. 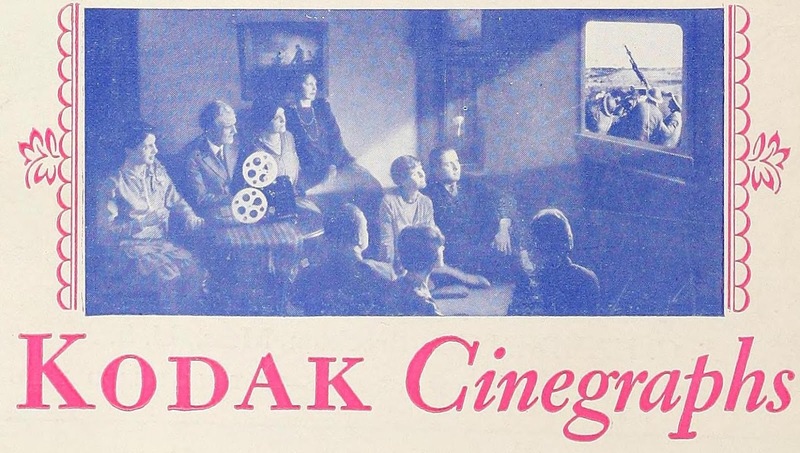 In addition to making home movies, people could buy or rent films from the Kodak film library, a key selling point. Amateur film makers could buy a complete 16 mm outfit from Kodak consisting of a camera, projector, tripod, screen and splicer for $335. The disillusionment that followed shortly after the Peace Treaty of Versailles resulted in few war films in America during the 1920s. There were some blockbusters to be sure, notably The Big Parade (1925) and Wings (1927). But these were fiction. Documentary war films for a wide audience were not considered commercially viable. This changed somewhat with the introduction of home movies in the United States. A new market was opened and footage that had been shown in the regular theaters could now be released again to interested customers such as veterans of the Great War. 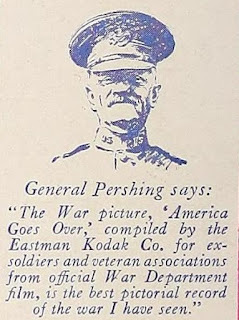 The Kodak series on World War I was taken from America Goes Over (1918), a production of the Committee on Public Information (CPI), America's wartime propaganda agency. Rereleased on 16 mm Kodak Cinegraph format, the customer could order the full series of five episodes or buy a single film. We found "Flashes of Action", one of Kodak's first home films of World War I, in the Periscope Films collection and have uploaded it on our YouTube channel. The original 1918 CPI production America Goes Over can be watched here. 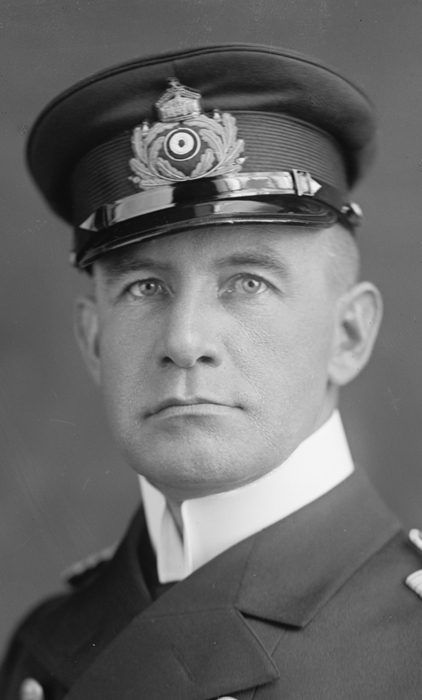 A conspicuous figure behind the scenes in Germany during World War I was Dr. Lewis H. Marks. More than just a regular research chemist doing business in Berlin, Marks was also a secret agent for the German government, spying on American reporters. Lewis H. Marks. 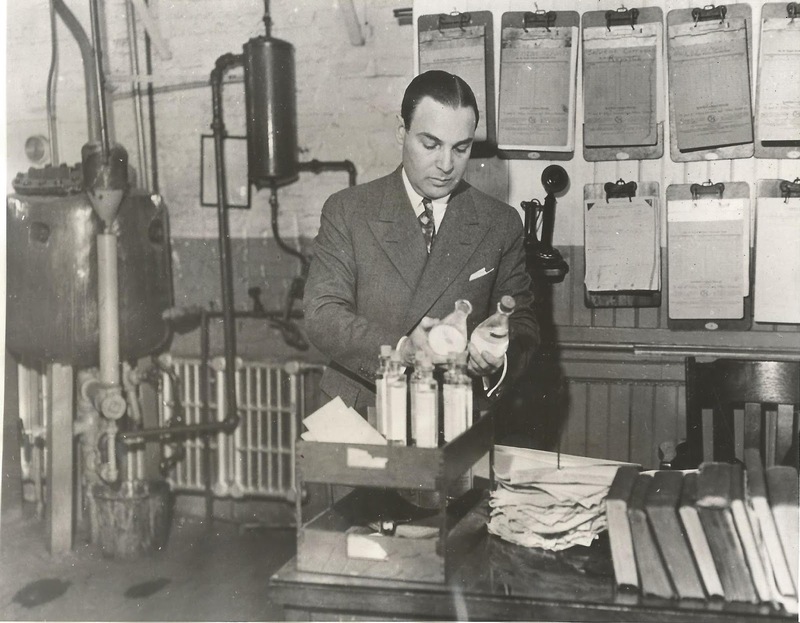 Press photo from 1933 when he became President of the Continental Distilling Corporation in Philadelphia. Authors collection. Born in New Orleans in 1883, Lewis Marks studied medicine and came to Frankfurt am Main, Germany, in 1907 where he became an assistant to the famous Dr. Paul Ehrlich, the man who discovered the cure for syphilis. Apart from selling serums to the German army during the First World War Marks also used his extensive contacts with the German government to assist American journalists, helping them with an interview or a permit to get to the front. This way he gained the trust of these American reporters who even made him an honorary member of their correspondents club at the Adlon Hotel in Berlin. But they didn't know that Marks filed secret reports on their whereabouts and activities to some very high-placed German officials. Apart from his dealings with American reporters Marks was also involved in propaganda for the Germans. He was instrumental in sending the first German war films to the United States and accompanied newsreel cameraman Ansel E. Wallace to the Eastern Front in January 1915. In fact, Marks' involvement with film propaganda continued throughout the war, as we discovered during a recent research trip to the Military Archives in Freiburg, Germany. Marks was in close contact with Major Hans von Haeften, the man who was the driving force behind the Bild- und Film Amt (BuFA) which was set up in the summer of 1916. This was the first attempt by the German government to coordinate and produce film propaganda. Though it did not really succeed in its aims to boost morale BuFA helped to lay the foundation for UFA and the thriving interwar German film industry. Hans von Haeften had worked in military intelligence at General Headquarters for the Eastern Front and was very much interested in boosting official film propaganda. A report from the BuFA files at the Military Archives in Freiburg (RM/9901) refers to Von Haeften who was present at a meeting on July 29, 1916, saying: "Dr. Marks recently came to me in order to represent the interests of the American film companies. He said the Americans are not interested in sending cinematographers to Germany to make their own films. But they would like to see what movies are available and select the footage that is suitable for distribution in the United States." We also came across Dr. Marks in a secret report by naval officer Captain Karl Boy-Ed. Here we have another fascinating figure in World War I history. As a naval attaché in the United States Boy-Ed had established a spy and sabotage ring until his undercover activities were disclosed. In December 1915 he was expelled from America and on his return to Germany Boy-Ed was put in charge of naval intelligence. Marks contacted Boy-Ed in 1916, and gave him confidential information on the American reporters. Boy-Ed's notes confirm Marks' secret activities, up to the point of suggesting which journalist could be bribed for any pro-German publicity and who couldn't be trusted. The report also mentions Von Haeften's propaganda activities and again shows that Dr. Marks knew him well. Here is a copy of Boy-Ed's file on the American reporters, mentioning Lewis Marks as his undercover agent, including a translation into English. Dr. Lewis Hart Marks died in Paoli, Pennsylvania, in 1958. This website has a short biography on Dr. Marks. Also, for more information on Marks and his secret dealings during World War I, check out our book American Cinematographers in the Great War. World War I Combat Camera Edwin F. Weigle Found! Radford Polinsky recently contacted us with some intriguing news about the discovery of an original combat movie camera that was cranked in 1918 by Lt. Edwin F. Weigle, one of the top American cinematographers in the First World War. As described in more detail in our book American Cinematographers in the Great War, Weigle was the "star" cameraman for the Chicago Tribune who accompanied the Belgian and the German army. His films On Belgian Battlefields (1914) and The German Side of the War (1915/1916) were among the most popular contemporary World War I films released in America. When the United States entered the Great War Weigle was also one of the first officers to set up a photographic division for the U.S. Signal Corps. Weigle's camera is a Bell & Howell 2709, serial number # 250. The camera was identified by Jim Elyea who found a note saying this camera was picked up at the [Bell & Howell] factory by Lt. E. I. [sic] Weigle for the Signal Corps on June 1, 1918. The cameras are part of of his rental collection for History for Hire, a prop house that was started by Jim in 1985, which features a large vintage media collection. Jim explained: "It is one of four 2709s in our collection. I have no memory of when or where we got it. Right now, it has no movement, but if need be, we could probably install one from one of the other cameras." We recently discovered Weigle went to Fort Sill, Oklahoma in June 1918 to film operations at the U.S. Army Artillery School. This previous weblog has more information on Weigle's film report. Given the date, Weigle probably used this specific Bell & Howell film camera to shoot these scenes. Shortly afterwards, Weigle was assigned to the 35th Division of the American Expeditionary Force. He went to France in the summer of 1918 and in October 1918 we have him shooting film of the Meuse-Argonne Offensive. Here is some of Weigle's footage taken with the 35th Division, that we found at the Imperial War Museum in London. In our book American Cinematographers in the Great War, we reproduced a picture that was taken shortly after this offensive in late October 1918, showing Weigle demonstrating a Bell & Howell 2709 to General Peter Traub, the commanding officer of his Division. Again, this seems to be the very same movie camera that is now in the collection of History for Hire. U.S. Signal Corps Photo Section Motion Picture Unit in action. Sgt. 1st class Polinsky (left) served as camera operator, with Pvt. Maxwell as camera assistant. The camera is a 35 mm U.S. Signal Corps Liberty model from 1918. Photo courtesy Radford Polinsky. Bell & Howell produced the 2709-types in different batches. Mary Pickford owned a 2709, serial number # 230 which was sold in February 1918. The Thomas Ince Studio bought a 2709, serial number # 241, sold on February 23, 1918. It stands to reason serial number # 250 was sold shortly afterwards in 1918, which ties in with the date on the note that was found by Jim Elyea. The first all metal camera with a four lense turret and twin compartment magazines, the 2709 Bell & Howell became a classic Hollywood motion picture camera. The design was so good that the basic camera body remained in production unaltered until 1957. 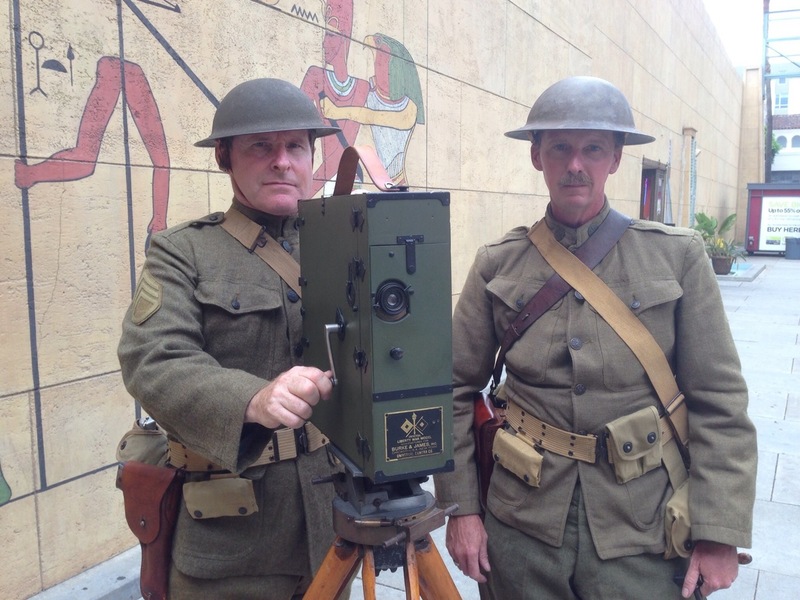 A film history fan, Radford Polinsky has participated with costumed World War I reenactors, using historic movie cameras from Jim Elyea's remarkable collection. "I work in the motion picture industry, and happily I went though film school back when they actually used film, so I have a basic grounding in the technology of film. I borrowed and brought a Signal Corps Liberty Model 35 mm hand cranked motion picture camera to show how some of the motion picture imagery used in World War I newsreels was captured. The owner of the camera is interested to let us use the Signal Corps Liberty Model to document World War I Centennial events. Now that we are well into the Centennial, we are getting serious about it!" Check out the website of the Great War Historical Society for more photos of the 1918 U.S. Signal Corps Photo Section Motion Picture Unit in action at the Los Angeles National Cemetery Memorial Day event for 2010. Great job, Radford and Jim. And many thanks for sharing this information with us. We hope you take good care of Weigle's film camera!